The manufacturing industry is continuing to embrace cloud technology-providing customers with both privacy and security protections and offering an extensive set of security and encryption services to help ensure complete customer control of their data and ways to drive business value. THE MANUFACTURING INDUSTRY IS GOING through a transformation, commonly referred to as Industry 4.0, which is changing the way products are made. Manufacturers are connecting data from across their plant operations, using machine learning (ML) and artificial intelligence (AI) to discover new insights and make predictions with incredible accuracy, connecting to physical devices (the Internet of things [IoT]) to capture information that would otherwise be impossible to collect, and using these tools to improve business operations and drive innovation. At the heart of this transformation is the cloud. By moving IT infrastructure to the cloud, manufacturers are able to access cutting edge technology, and do it at a fraction of the total cost of implementing them on premises. 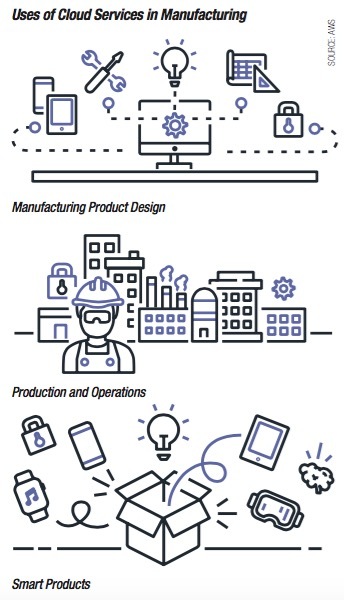 The benefits of this digital transformation are widespread throughout the value chain, but there are four primary areas within industrial settings where customers are realizing value on the cloud: product and production design, smart factory (optimizing production), smart product (intelligent products that enhance customer value), and enhanced security. Once relevant data is stored, cloud providers can offer Machine Learning and AI tools to both extract insights from data and maximize its business value. The product and production design process deals with the initial stages of product development and exactly how those products will be manufactured. By moving product and production design, and engineering simulation workloads to the cloud, manufacturers can accelerate time-to-market while reducing costs. Running high performance computing on the cloud allows scaling to larger numbers of tasks than would be possible on premises. It also allows product developers and engineers to solve complex problems using model-based design and large-scale, parallel simulations that would not be generally practical in an on-premises environment. In a cloud computing environment, new IT resources are only a click away, which means that businesses reduce the time it takes to make resources available to developers from weeks to just minutes. By moving product and production design, and engineering simulation to the cloud, manufacturers can accelerate time-to-market while reducing costs. The cloud makes cooperation and collaboration practical for internal IT and Operations Technology (OT) teams, since it meets the needs of both camps, at a fraction of the total cost of on-premises equipment, like an industrial data center. Many factories today are comprised of point-solutions to do specific tasks across their facilities which include a myriad of devices, controllers and sub-systems all with varying protocols and levels of data access. This fragmentation makes it difficult to extract equipment data, much less insights from the data. With a low-cost, secure and reliable method of integrating operations and IT across the enterprise that provides capabilities for connectivity, data/device management, analytics, ML, and AI, manufacturers can begin to optimize business operations. All that is available on the cloud today, and starts with a data lake. For manufacturing operations, data lakes help create a single view of an enterprise, providing factory operators with insights to improve process orchestration, identify and address out-of-tolerance conditions, and give better visibility of manufacturing performance across multiple machines, lines, or facilities. A data lake can ingest, store, analyze and consume data, and ML and AI can provide the insights to improve operational efficiency. Turning to the cloud provides an opportunity to break down data silos and provide businesses with the flexibility to ingest a variety of data from new or existing equipment and historical sources. It also enables the ability to seamlessly connect to internal and external applications, which helps extract data from legacy systems. Additionally, cloud providers can aid in the set up and management of a data lake, without a lot of manual, complicated, and time-consuming tasks, in turn reducing the time it takes for a business to see results. Once the relevant data is stored in a data lake, some cloud providers offer ML and AI tools to extract insights from that data that can drive further business value. Factories can improve service levels, product quality, operational effectiveness, and other aspects of their operations using these innovative technologies. Consumers are demanding personalized products, and products with new capabilities like onboard diagnostics and predictive maintenance capability to warn of faults before failures occur. Understanding customer behavior allows manufacturers to improve their products and better anticipate what customers are looking for next. According to McKinsey analytics, organizations that leverage customer behavioral insights outperform peers by 85 percent in sales growth and more than 25 percent in gross margin. With the proliferation of smart products and smart machines, the cloud helps manage and securely connect those devices, and collect, store, and analyze device data at scale with potential global availability. Scalability is important so manufacturers can focus on building a better mousetrap, not on scaling resources as their device fleet grows. Manufacturing companies can be more competitive when they transform from producers, to smart product and service companies capable of new revenue streams. As more and more companies scale globally, they need to share critical data and key intellectual property across different teams and in different sites around the world. To do that, a robust security architecture that still makes data sharing easy is important. The focus on security in factories has never been more important than today, since attacks on operational infrastructure continue to increase. In 2018, 31% of security professionals said their organizations have already experienced cyber-attacks on OT infrastructure . Manufacturers can benefit by leveraging the high standards some cloud providers already provide for security sensitive organizations such as healthcare with HIPAA-eligible services, or financial services and government with the ability to define, enforce, and manage user access policies across their services. The journey to the fourth Industrial revolution, leveraging the cloud, can be made easier by working with partners who understand the industry and have proven experience moving industrial workloads to the cloud. Manufacturers who have successfully transitioned to the cloud are reaping the benefits of Industry 4.0 to help them remain competitive in a global market - increased agility, scalability, cost savings, access to the latest features and services, and the ability to scale their business globally. Ultimately, turning to the cloud lets businesses focus on speeding time to market, improving business operations, and enhanced product innovation, and not on the complex IT and OT infrastructure required to make it happen. National Instruments (NI), a global leader in automated test and automated measurement systems, leverages the cloud to quickly scale workloads and for increased compute capacity. Historically, NI′s development teams tested new features for products, such as field-programmable gate array (FPGA) technology, on premises. Yet as the company grew, more infrastructure was required. At the same time, FPGA designs were becoming increasingly complex, requiring a greater amount of compute capacity. To lower its costs and improve development times, NI′s LabVIEW team, which is responsible for FPGA technology, moved to the cloud. "Before, we had a homegrown scaling process that could take anywhere between 5 and 30 minutes to scale in response to additional workloads," said Joe Gardner, Principal Cloud Architect at NI. "With AWS, that′s done in less than five minutes, which is a huge benefit for us because our customers don′t have to wait around for things to start." Georgia Pacific, a leading manufacturer of paper and wood products, leverages the cloud to build their data lake and ML to improve asset utilization and optimize production processes across multiple plants. This change has resulted in millions of dollars of annual savings related to unplanned downtime, and tens of millions of dollars in savings around process optimization. iRobot, a leading global consumer robot company, designs and builds robots that empower people to do more both inside and outside the home. They made the decision to move their mission-critical platform to the cloud. "The AWS Cloud offered an essential combination of scalability, global availability, and breadth of services," said Ben Kehoe, Cloud Robotics Research Scientist. "What really grabbed our attention is that AWS offers powerful tools and integration capabilities that enable us to use a serverless architecture that saves us the headaches of learning to scale." The technology is providing customers with both privacy and security protections, including providing an extensive set of security services and encryption to help ensure complete customer control of their data. Scot Wlodarczak, Industry Marketing, Amazon Web Services.